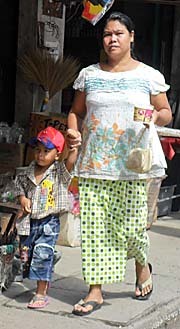 A woman selling simple food on the streets, accompanied by a small girl helping her. Particularly the girls help their mothers at work. The boys rather hang out lazily. Painting found in Hua Hin, Thailand. A Kayan/Karen girl in Nai Soi refugee camp close to the Thai / Burmese border. Her tribe belongs to the so called 'Longneck Karen', who's girls and women often (traditionally) wear brass necklesses of a weight up to 10 kilos. Smart Thai businessmen provided the place to the refugees, made it public and charge visitors entrance. 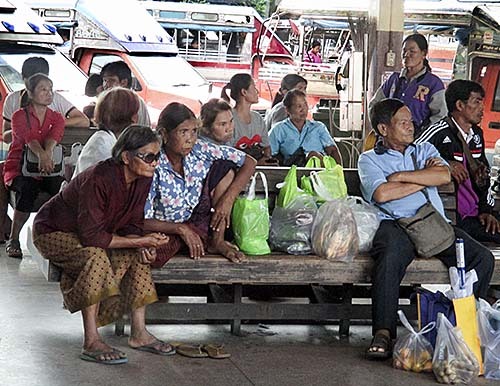 Therefore, Nai Soi is blamed to be a 'human zoo'. Thailand is a great destination for tourism and travelling. It's save, quite well organized, relatively inexpensive and has a variety of different areas and landscapes with different climatic and geographic zones. Above all, the people are great to tourists and travellers. They are widely friendly, relaxed, calm, avoid aggressions and confrontations, show generosity and are almost always willing to help a foreigner. If one has a problem and ask a local person for help, they do what they can to solve the problem. Thai People are generally very generous and like to give. They like to invite foreigners to parties and want them to share their food and drink with them. Hitch-hiking is probably nowhere easier in the world than in Thailand. Especially in remoter areas almost any vehicle stops and gives the hiker a lift. That's maybe not the impression tourists get in touristic places, where Thais mostly seek to do business with foreigners. Generosity faints when it comes to business. Thai businessmen are as same sticking to the economic principle as any businessman in the world: buy as cheap as you can, sell as expensive as you can. 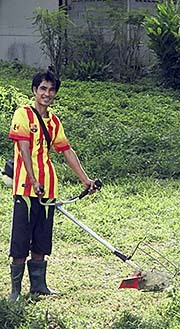 But even there are some Thai People who show a great deal of generosity to others. The families are most important for the People of Thailand. Individuals keep to their families even if they are bad to them, being abusive. This strong relationship to the family does not match the Western pattern of individualization. But, we shouldn't forget, this Western pattern is also new, developed mostly in the aftermath of 1968. It was revolutionary for Westerners to emancipate from their family influences in the last decades, if they wanted so. And Thai's mean fun. They like to laugh and if you smile on the road to any Thai person who you have never seen before it's by 90% sure he or she will smile back. Try that in Europe - you will be considered a moron. 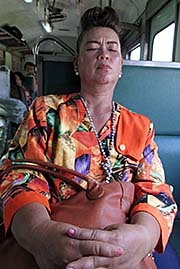 There are a great deal of peculiarities on Thai People, not easy to understand for tourists. Better understandable Thai's become when one compares them to Westerners. In England, France, Germany, the USA and other western countries was since about 1750 the industrial revolution ongoing. Over generations western people worked in factories or in technical environments. Schools taught pupils already natural sciences and skills to prepare them for their coming working life. Actually they made them the human material for the industries and the states, particularly useful in wars. War as a craft - skilled officers were required. After the Second World War there was for decades full employment in the industrialized western countries. Everybody had a job and was due to it integrated in the modern western societies. That all shaped Westerners over generations very much in their mentality and abilities. Thailand never had something like an industrial revolution nor did it take a crucial part in the two world wars, where the western human material was very much brainwashed, shaped and brutalized. There was no big war in Siam/Thailand since the 1760s, when the Burmese destroyed Ayutthaya. 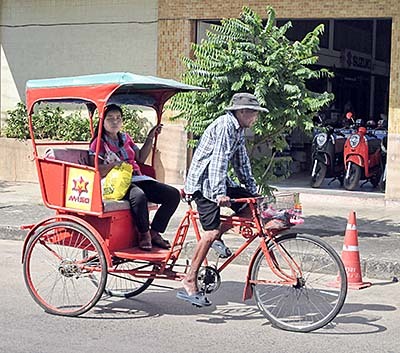 Thai People are therefore different, living an older, rural, rather kind of back-in-time lifestyle, partially even a kind of premodern, feudal lifestyle, although there were many attempts from the government to modernize the country and with it the peoples mentalities. From the 1970's and more the 1980's on they are also living in a more and more modern, urbanized and industrialized society. But it's still strange for them; it's not coming out of their own culture and history. It's just adapted, mostly from Britain, France, North America and Japan. However, the rampant and ongoing urbanization triggered a value shift. The people of Thailand are not a homogeneous mass. 75% of the population has ethnical 'Thai' roots. 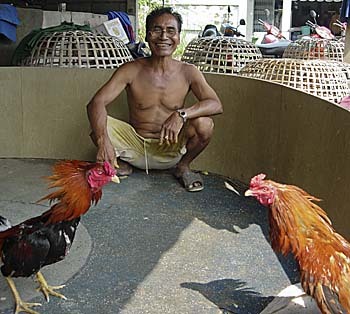 They are living in Siam/Thailand since many generations, up to 1,200 years. But things are not so easy. About 21 million people live in Thailand's northeast, the Isan. This part of the country is not core Siam but has been incorporated slowly over centuries into the Thai state, particularly since the late 19th century. The people of Isan have mostly Laotian roots and were resettled here in the early 19th century from the lands east of the Mekong River. 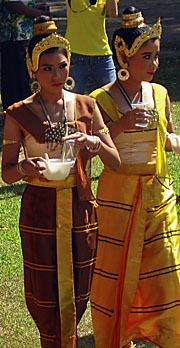 They refer to themselves usually not as Thai People but as Isan People (khon Isan). They still speak by a great deal their traditional language in leisure context and Thai merely in official situations. The nation state and the nation are highly artificial constructions. Constructions per definition. In fact there is no such thing as a nation. Nations do not exist, but are invented. It's ideology, to make people either equal or unequal1. Some have a national passport, others not. Some have a work permit, others not. 25% of the population splits up into Chinese/Thai, Laotions, Khmer, Malays (mostly Muslims), Burmese, who have a hard life in Thailand, Vietnamese and many different tribes, the so called hill people like Karens, Lisu, Lahu, Hmong and many, many others, who are living mostly in the north of Thailand in remoter hill and mountain areas. Many of the 25% do not have full citizen rights. It lasts officially three generations to get a nationality granted. 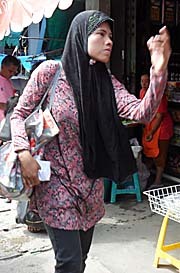 Many lack official Thai nationality and have no Thai identitiy cards or working permissions. Though, some of them live since more generations in their places in Thailand than their Thai national neighbours, who came maybe later. Others move time by time, crossing borders in the mountains where are no checkpoints, settling down there for a while before moving on again. Besides, there was over all the times a never interrupted stream of immigrants from China to Siam/Thailand. Nowadays there must be also 100,000s of Westerners living in Thailand since the 1960s/1970s, immigrating more and more since then. They pay a considerable contribution to local economies, particularly in Isan. 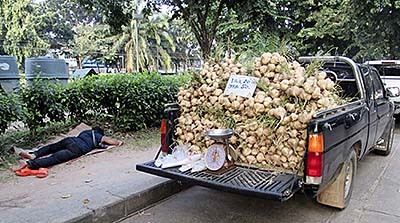 Thai society is, as all civilized societies are, a highly vertical class society. But here it's still following a feudal pattern. 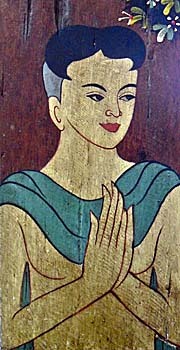 The 'sakdina' system, invented in the 15th century in Ayutthaya, relates to any subject in the kingdom a certain number which is equivalent with social status. 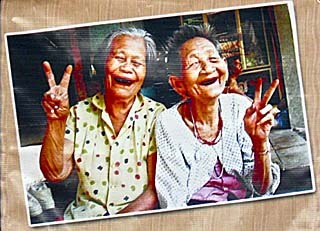 Sakdina makes any Thai different, even twins are differently valued - the first-born ranks higher than the second-born. The lower class get's almost no education. They do not develop skills for troubleshooting, realizing, analyzing and solving problems. Among the men there is much alcoholism, frequently drinking of cheap rice whiskey. They have little or no sense for health or a healthy environment. If they get money, they like to spend it immediately and for a great deal in parties or gambling. There are non-stop parties around in neighbourhoods, and they are, again, extraordinary noisy with their music. The parties are boring, because it's just superficial fun. Conversation is barely possible. First, the music is too loud, second, the people have nothing of substance to say. They know nothing, they are not interested in what's going on except gossip, sports, business and gambling, they don't like to learn much and actually don't seem to have an opinion. If they have an opinion, they usually don't speak out. They don't discuss things, because there could be different opinions and that could cause disharmony, say clashes of meanings, loss of face, aggressions. Confrontation has to be avoided. One finds very, very few exceptions to this. Lese-majeste and political censorship keep people quiet. Free speech is often a dangerous thing. A remarkable experience which repeads all too often is such that, when asking someone a simple question, let's say the price of a certain item in a retailer shop (usually there are no price tags in these shops), the shop assistant turns his back on the questioner and passes the question to another person in the shop. This person might transfer the same question to a third person, and a longer 'blah blah blah' starts until one get's an answer, which is often wrong. That's the same thing when asking for transport opportunities at a bus station or for the way to a certain, well-known place or whatever. I made that experience even in a school when I asked a pupil a question and she turned to her neighbour and started to discuss the question of who she was expected to know an answer. It shows that the people are not able to use their own wit and don't dare to make a decision - they could be wrong and loose face. Moreover it requires an authority to make even a simple decision of who a common person is not considered of being warranted. Besides, there is a climate of fear in Thailand. Freedom of speech is not given. Political censorship in Thailand is very strict. Who speaks out freely his opinion, might it be in conversations or in the internet, risks to be persecuted and sentenced for years in jail. This situation is so bad since long, worsened after the military coup in September 2006. After the July 3rd 2011 elections, who brought Yingluck Shinawatra into the office as primeminister, there was no change to the better to see in Thailand. After the military coup of May 22nd, 2014 things are worse than ever before. The middle class is uncritical, they are superficial consumers, appear unnatural in their role as middle class (let's say very alienated and affectedly), not seldom ridiculous and are often uncultivated. They love shopping, particularly abroad in Southeast Asia and Europe, expensive fashion and livestyle products, they love expensive resorts, bad restaurants and they drive much too big cars. Their education is focussed on business skills; the rest are stereotypes. Their kids are nowadays more and more spoiled and materialistic. Politically they are reactionary and don't have any progressive ideas for the future. Inner emptiness behind the facade of a happy, successfull person. It all comes with sycophancy towards authorities. The upper class, the rich business men with mostly Chinese roots, appear always as the smart guys. They are proud on what they have: money, status and (more or less) power. They let you know quite fast that they studied in America or Europe on an elite university and that they make business here and business there - big business. They expect one to be impressed then. If you let them talk and ask them some critical questions, showing that you have an own opinion and being willing to argue, not just to subdue to their opinion, they don't enjoy it. They want to be adored. They claim to be the authorities, to be superior, because of their monetary status. Of course, (ultra-)nationalism plays an important role as well. Anson Chi paints a lively picture of that poor kind of mentality in his novel 'Asian Cultures Revealed. The king is dead. What now...?! Bhumibol Adulyadej, born December 5th, 1927 in Massachusetts / USA, grown up mostly in Lausanne / Switzerland, became king of Thailand in 1946 (coronated in 1950). He resided permanently in Thailand from 1950 on. From 1957 on, Bhumibol became in alliance with the Thai army's leading general Sarit Thanarat a more and more prominent personality in the country. 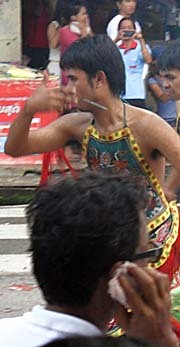 An increasingly overwhelming palace propaganda promoted the king as a semidivine fatherfigure of the Thai People, following the ancient Hindu concept of a devaraja. As a psychological and emotional fixed star of the state he played an integrative role and served as a role model for many people in Thailand. The superhuman image of the king of Thailand is supported by a draconian lese-majeste law, which forbids any even slightest critical approach to the king, the royal family, the king's dog, palace politics and even historical kings of former Thai states until back to the middle ages. 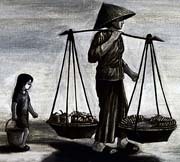 Many people in Thailand suffer imprisonments up to decades for alleged insultances. Criticising the lese-majeste law is also forbidden in Thailand. 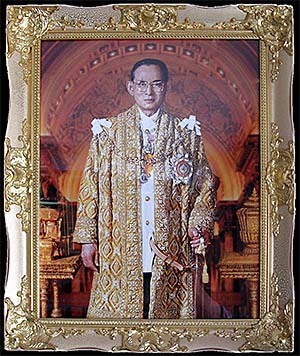 Bhumibol Adulyadej was the last godking on earth. He died on October 13th in Siriraj Hospital, Thonburi. Apart from what Bhumibol really was counts what the People of Thailand believe what he was. The image of a wise, kind, modest and benevolent leader of the nation had a huge impact on the mindset of many Thai People. It is to expect, I am afraid, that much of the good traits the Thais have, will pale out in the future. Questionable is the political future of the country. Behind the surface, there are massive long-term tensions in Thai society who maybe erupt again in more or less violent forms in the soon future. In general I would say, Thai People have little capacity for abstraction, for anticipation and for aesthetics. That's qualifications one has to learn and to develop. Thais don't learn that. It's not part of their history, and the schools fail completely to teach them concepts and useful skills. It's pretty apparent that the elites want the people silly. Because then they can not question the political and economical system they are living in. They can not cope with the smart Bangkok business elities who are, in contrary to the majority of Thai People, in a way educated. Many of them studied abroad on American or European universities. They speak English fluently, rather an American English. Most of them have Chinese roots. Thai People are not technicious. They don't care for maintainance of technical commodities they use - they buy them, run them down, and when they fail, they mend them. Until they fail again and again and again. No problem. One can always mend again. If not, buy new. All these attitudes are very difficult to understand for a western tourist or traveller. It might be very amusing on the first glance, or very irritating. Mostly the peculiarities here are explained by the differences of culture. However, there is a better approach to the phenomenon, that many of the Thai People appear rathern childlike than as adults. Crucial for an understanding of Thai People (as most people in the 3rd World and Southeast Asia) is the understanding of human childhood development. A great model about that gives the concept of cognitive development by Jean Piaget. Piaget was a 20th century Swiss psychologist. His observations on cognitive development of children describes four levels of learning in detail. In the first three levels a child learns many basic things starting with getting food, gripping things, language acquisition and realizing the permanence of objects. The fourth level starts at the age at around 12 years; in this part of development the child learns logical thinking, abstract thinking, anticipation, the ability of thinking about thoughts and making conclusions, and a clear sense for cause and effect. It's the level of formal-operational intelligence. These four levels are universal for all people, doesn't matter their local culture. A higher level can only be reached when the preceding level is successfully completed. The point now is that the verymost people here didn't reach level four. They stick on a level of human development far below their potentials, doesn't matter how old they get. These development deficits also concern many Westerners, but here in the 'third world' it's clearly the norm, affecting the vast masses of people and, particularly in Thailand, I find very few exceptions. Most people literally remain on a childish level of intelligence development. That is very serious, because living in a society with literally retarded people is bad for everybody. Humans are social beings, and our all sake depends on living in a society as sane, civilized and cultivated as possible. All the huge problems of our contemporary world can barely be solved by people with a severely minor IQ. There is also to mention that Thai People are mostly non-readers. All they might read are the newspapers (most of them are on a level even below the British 'Sun' or the German 'BILD-Zeitung'). Some read comic books and very, very few I see with a religious book in their hands. That's it. I have also never heared of an important Thai author who is acknowledged in world literature. Very most Thai's have never been abroad and can not compare their own culture to any other. That's a big difference to the Westerners who are travelling in Thailand and compare all the time what they see in Thailand to their own countries and additionally to third countries they have travelled to as well. Thai's are very much under influence by their schools and state propaganda, which is everywhere present. 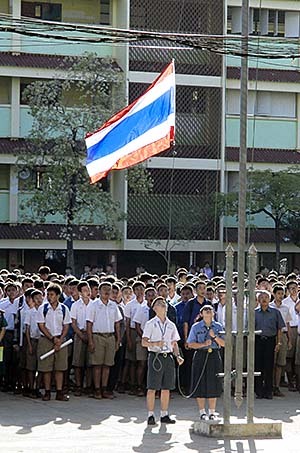 In the mornings and the evenings it's common in Thailand, that the neighbourhoods are penetrated by noisy loudspeakers, who make announcements, play (better: blare it out) the national anthem and radio and pop music. These loudspeakers are operated by either the local authorities or neighbouring temples. The temple programmes are different in content, but at least as noisy as the other annoyances. It's indoctrination and distraction, not information. 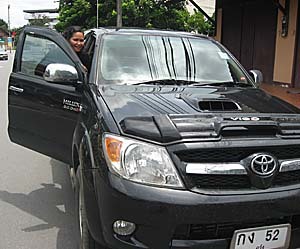 Many Thais, as most Asians, have a strong tendency of being noisy in general. Their vehicles are often noisier as they could and should be, they 'love' music2 and parties with a deafening noise level penetrating the neighbourhoods often for days and nights. 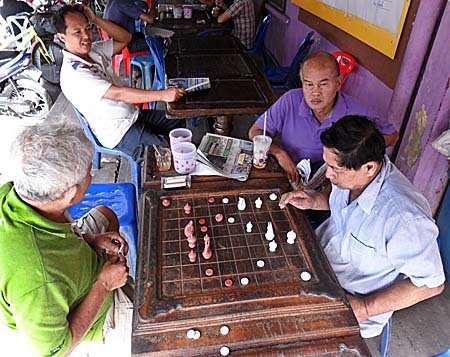 In the times of miniaturization of entertainment devices everybody has a mobile phone or anything to play sounds with - Thai's love that, and it's everywhere. There are omnipresent TV's around in restaurants, buses, police stations, banks, immigration offices, custom offices etc., often set so noisy that it is barely possible to communicate anymore. Noisy advertisements are done by loudspeakers in front of shops or on cars driving around the blocks in neighbourhoods, so exaggerated one wouldn't belive it if not witnessing and suffering it severely himself. That's the same thing with any kind of pollution. Thai's don't sense limits. The air might be as much filled with smog as it can, they don't stop to burn rubbish including plastic litter in great amount and continue to pollute. That's also reflected in a low health consciousness of the great mass of the people. The degree of noise pollution, air pollution and health consciousness corresponds with the educational level. The schools unfortunately don't teach the children and youngsters necessary skills for their future, how to solve problems and to think technically. Instead there is much drill and one-dimensional propaganda of national themes. That keeps them very much back from the opportunities the 21st century offers. It's also very poor that the vast majority of Thai People does not learn English or any other foreign language. That keeps them in kind of an isolation from the global society. Although there is English taught since decades in Thai schools, often by English native speakers from Australia, America, England, and any Thai younger than 40 years should have learned English for years, many don't understand a single English word. The English teachers, by the way, lack any pedagogic qualification. For these Westerners it's merely a fallback solution to work here, for they didn't get a job in the west. All the Asian people care very much for status. 'To have' is most important, not 'to be'. If the poor just escaped starvation, they immediately long for a big, new car, a great pickup truck. Many poor people sell their houses and land without moving out. They keep staying there, pay rent from now on to the new owner of their former property and buy a big car for the money they got, and as many other consumer stuff they can get for the money they got. What at the first glance looks like a waste disposal site, is a 'wonder tree'. 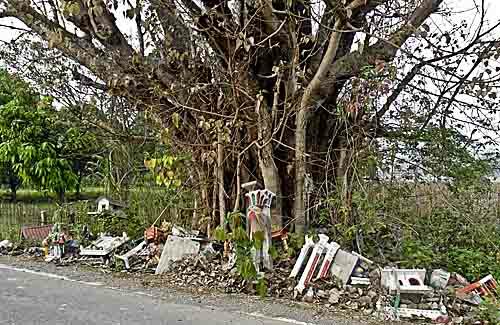 The 'litter' consists mostly of parts of former ghost houses, put at the foot of this bodhi tree. It means luck to deposit them here, because there is following story told around: Once there came a man along this spot. His car failed, so he had to stop here and to leave his vehicle to check out what's wrong. Suddenly he heared a voice, coming out of the tree. The voice told him he earned merit and would receive therefore a bounty. The voice then gave him the numbers who would win in the next lottery. 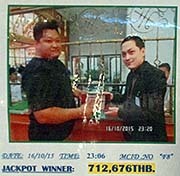 He suddenly could use his car again and went to the next lotto booth, played the numbers and won a great deal of money. One has also to say that there is much superstition, the importance of image over substance and of social harmony over truth, a great tolerance of social ills and a willingness to smooth things over instead of addressing ugly problems head on. But that's not typically Thai; one can see these tendencies also in other, including Western countries. In every Western country there are certain strong tendencies for superstitions of differend kinds. Although Westerners consider themselves generally free from superstition, nowadays many have their private religion, usually very weired ones. Thais do so also. Though, there is definitely much more superstition in Thailand than in the West. It's sometimes very frustrating to be confronted with total incompetence, ridiculos decisions or a stubborn bureaucracy. I am told then sometimes, it's the Thai way. Not all Thai's agree with it, but it's dominant. Of course one finds such things happen in all other countries in the world as well, in their particular way. State buerocracies are naturally blunt. Also it's a problem to criticize nuisances. It's expected to be obedient to authorities of all kind and not to question them. Especially the king of Thailand, as the highest authority in the country, has to be highly revered. Criticizing the king or even the law 'lese-majeste' itself, which criminalizes critics or any non-positive expression on the king, is persecuted and can be punished with up to 15 years of prison. There is one interesting experience every western tourist makes in Thailand. The Thai People call them 'farang'. What does that mean? Well, there are several theories about that. I rather stick to the one that 'farang' is a derivative of the English word 'foreigner'. That might has been established in Siam in the times when all the surrounding countries where colonialized and many British, French and other western businessmen were doing business in Siam. Another explanation is that 'farang' is coming from 'farangset', that's how Thai's call French people. 'Farang' then would be just a generalization for French as Westerners. I don't believe in this theory because the word 'farangset' is still in use for French, and 'foreigners' (farang) as an expression for all Westerners makes more sense. Hugh Watson, the author of 'Siam Smile(s)' has another interpretation for the notorious 'farang'. He translates it with 'barbarian'. That's a very ancient word, dating back to the old Romans, if not the old Egypts, who where among the very first people who built up a civilization. 'Barbarian' was the term for the non-civilized, they 'wild' people out of the border of the empire. Watson now explains in his book that the coronation of Carlemagne by the Pope, making Carlemagne the emperor of the medieval Roman empire in the year 802 CE, caused a shock in the civilized world of the time. There was still a Roman empire, the East Roman Empire with the capital of Constantinople. They were Christians. The Western parts of ancient Rome, which were conquered by the Germanic tribe of the Visigoths and later others, were now consequently seen as barbaric. How could the Pope coronate a barbarian, who was the king of the Germanic tribe of the 'Franks', as the 'emperor of Rome'? Well, the disgust of the east Romans, who had deep and farreaching contacts to Oriental Asia, reached even far-away China. 'Frank' became synonyme with 'barbarian'. The term 'Frank' changed slightly over centuries to 'farang'. 'Farang' means therefore 'barbarian'. Westerners are all subsumized under the label 'barbarians', following this interpretation. If some old women in a restaurant where I have my noodle soup, at the next table are talking about me as the farang but don't talk to me, because they think I wouldn't understand them, they are quite impolite. If another woman in a shop where I buy a coffee tells the shop assistant, that the 'farang' is 'ting-tong' (crazy), then it's really impudent. 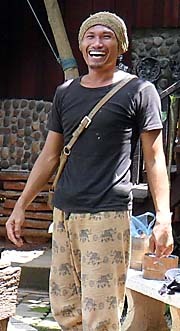 It's also weired to hear people calling 'farang' when a Westerner just appears, like the village kids mentioned above. When one is living among Thai People for a time and they continue to call him 'farang', then it's a sign of disrespect. For social relations the Thai language has an extremely sophisticated system of expressions. Since Westerners are out of the social hierarchical system of Thai society, the 'farang' expression is an easy way to put Westerners into a common category. Though, when one forms any kind of relationship to Thai People for longer than for a day or two, the 'farang' is no more appropriate. Somewhat like 'older brother', 'younger brother' or 'uncle' in combination with the real name or an abbreviation of it would be appropriate. Thais are not 'naturally' obedient and uncritically. There was a big democratic movement in the 1970s, achieving a more democratic government and laws from 1973 to 1976. There were big hopes for a better future for the masses of the people, for more participation in society and the economy and emancipation from old patterns. This progressive movement and government was quelled 1976 by a highly brutal and bloody military coup d'etat. Thai People tried to defend their freedoms and fought for it. 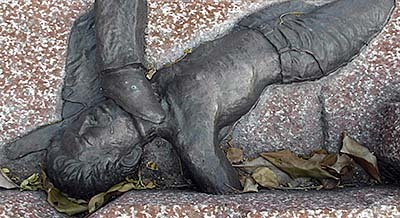 There were massacres committed by the military against the demonstrators (e.g. on Thammasat University, Bangkok). The military ruled the country in the aftermath of these brutal interaction in a highly authoritarian way. As it did before 1973 under US-American patronage. Tragically, for the development of a civil society in Thailand. Many of the negative tendencies one can observe here are the result of the oppression of all progressive movements until today. 1) See also "A History of Thailand" which gives more insight to the development of the concept of a "nation" and a "nation state". 2) They claim to 'love' music; it rather seems they like it noisy and can't stand quietness for a time.